In the USA this is a very popular way of playing dominoes, but not as well known in the UK. 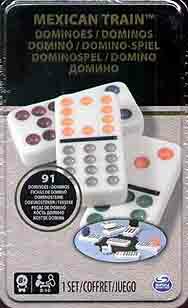 Basically, gameplay begins with a central domino on the hub, usually the highest double and then players play out their dominoes from this, forming a 'train'. If a player cannot add to their train, they draw a domino and place a marker on the end of their train, the marker being a little locomotive. What this means is that other players can now play onto that train as well as their own train. When the player who placed a train adds more tiles onto their train the marker is removed. And thats it in a nutshell.